You needn’t bother with the next few lines of that celebrated song because our country roads are not designed to take us anywhere, never mind home. 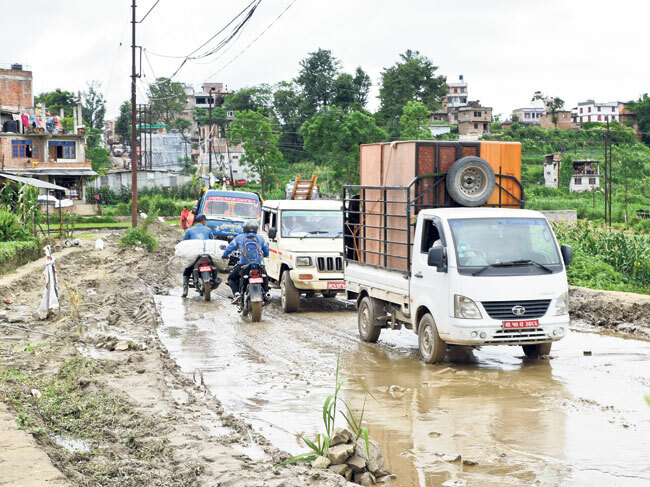 Around this time every year the monsoon lays bare our infrastructural deficiencies – whether it is the death trap‘roads’ in far flung parts of the country,the only ‘highway’ connecting Kathmandu with the rest of the country or even the major roads in the capital. 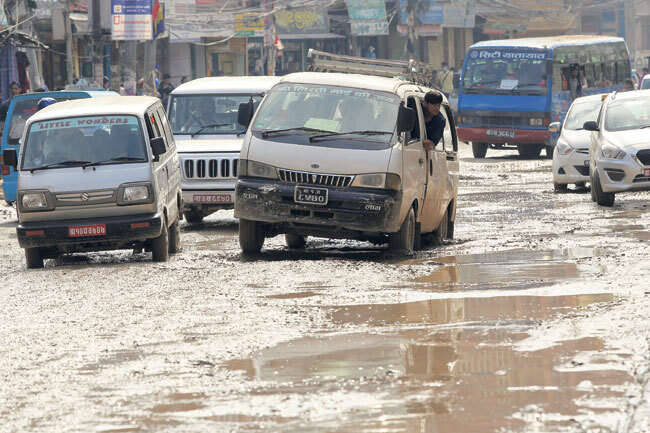 I’ve been in Nepal for quite a while now and the roads of the capital, in particular, are as bad as I’ve ever seen them. 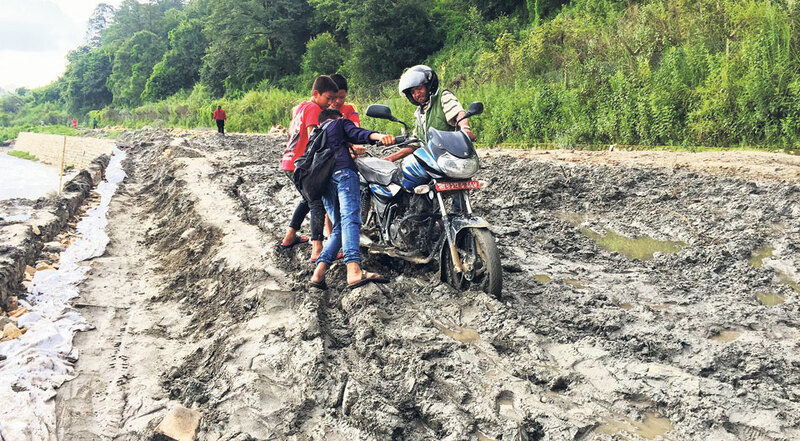 On a daily basis, I travel through some god-awful roads in Kathmandu and Lalitpur but even then, I’m pretty sure that there must be worse roads somewhere else in the capital. When it’s not the heat and dust, it’s either knee level flooding or dangerous slippery sludge. I had the misfortune of going to Jorpati recently and it’s safe to say that I won’t be going there anytime soon, which for me is a couple of years at the minimum. At least I have the option of not going there which the people residing there sadly do not have. While we all suffer through this hell every day, whether it is on our motorbikes or cars or on foot, our leaders are busy peddling flyovers, monorails, and a ‘smart’ city. Well, the only thing smart about this city are the folks in a hurry to get out of it. 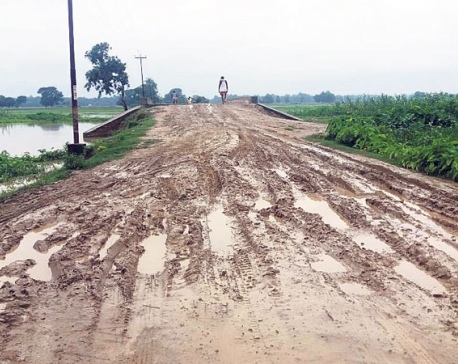 It’s not just our infrastructural deficiencies that the monsoon exposes every year – it also tends to lay bare our bureaucratic ‘end of fiscal year’ work culture. The same culture that allows administration officials to go on pointless ‘study’ tours and overseas junkets also governs the pace of work of most government projects and initiatives. Forget being cursed by Sati, our real misfortune is that our fiscal year starts and ends around the monsoon season. And while we might not be able to accurately predict the monsoon, we can, with depressing precision, predict when work on ‘public projects’ will start. The snail’s pace at which our entire administrative ecosystem works is not exactly a secret. It takes a couple of months for the budget to pass by which time it’s almost ‘Dashain’. And we all know exactly how much work is done in the build up to Dashain. 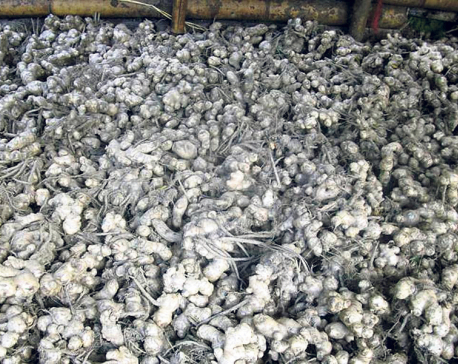 Then the program is approved by which time we have not only crossed ‘Tihar’ but also let enough time pass to have recovered from the holiday mentality leading us well into winter. And then when funds are released and the actual work commences, we are back to spring which is around the time of the Nepali New Year and – no marks for guessing it – the onset of monsoon. There is of course a political side to this culture too. Most of the good folks who work in the so called ‘construction’ industry aren’t exactly out to serve the nation. They are more interested in pandering to their political parties so that they can win contracts again and hope that this cycle keeps repeating itself so that they can continue to enrich themselves in the process. A steady income source with no accountability. What more could you really ask for? Even if our foreign friends wish to do something they will soon realize that there are too many mouths to feed and people to keep happy in this ‘democracy’ of ours. One look at the state of our ring road is enough to tell you the story. It’s sad that it takes the life of a child and a near miss for another for our decision makers to sit up and take notice. Our prime minister has now instructed people to cover drains and make the roads pothole free. It isn’t Deuba’s fault because he inherited these problems as most governments do – one from the other. It makes it easier to pass the buck around whilst doing nothing to alleviate the common man’s problems. One of the signs of progress and development of a country is its connectivity aka road network and, on this evidence, it is disingenuous to call us a ‘developing’ country as some folks tend to do. Whatever illusions of development we harbor can be quickly dispelled by one look at the state of our roads. There is hope on the horizon though. And I’m not talking about Deuba’s fifteen-day deadline to the government agencies (I doubt anyone is holding their breath over it). It’s the local representatives we have just elected and the optimism that the status quo will change in the near future. While metros and flyovers are ambitions worth exploring, the common man just wants respite from all this chaos and a degree of accountability from the authorities. We want to go to work, play, and socialize without feeling like we are risking our lives every time we step out of the house. At the moment, what we all do is take a deep breath, say a little prayer and get out of the house to join the snail’s pace of traffic on our roads. There’s no saying if or when we will get to where we have to. As John Denver famously sang ‘….Driving down the road I get a feeling that I should have been home yesterday’. We know that feeling all too well.